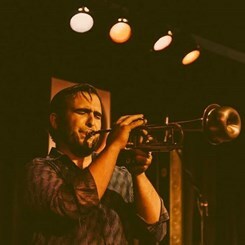 Nick Fields is an up and coming trumpeter in the CNY area in the jazz idiom. This year he has added a host of credits, playing with the Syracuse Stage and the CNYJO, as well as The Fabulous Ripcords, the Legendary Blacklites, U.A.D./Kings of the Fall, the Silver Arrow Band, the Jess Novak Band and Second Line Syracuse (the last two of which won SAMMYs for their recorded efforts). He appears at numerous festivals, oft-times transcribing and arranging the horn parts for such events. Nick is an active teacher with trumpet and piano students, as well as an enrichment instructor with SAY YES to education. Holistic educational principles are at the core of his curricula, so students can expect to walk on an un-tread path or two to achieve their goals at his Music and Arts studio and beyond. He looks forward to meeting all of you!